Last Saturday, SF’s Department of the Environment had a 3-hour bus tour of Landmark Trees and I went. It wasn’t what I expected. I thought we’d see maybe the city’s most spectacular trees, on a cold foggy day. What we got was a bus ride through parts of the city I don’t usually see, a visit to a few trees, some fascinating local history, and the Quesada Street community garden. And really nice weather. We started with six old eucalyptus trees planted by Mary Ellen (“Don’t call me Mammy”) Pleasant, an amazing character who was active in the underground railroad. A little research indicates the trees are probably around 120-125 years old, about as old as Sutro Forest. 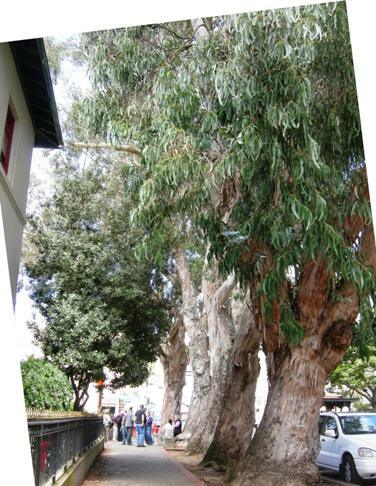 They were gnarled and large – much wider and more branched than our Sutro trees, though not as tall. I think this is all about light: forest trees have to grow tall quickly to get sunlight before nearby trees block it; street trees in a sunny area need to grow bushy to take advantage of the available light, and develop thick trunks to support their heavily-branched structures. 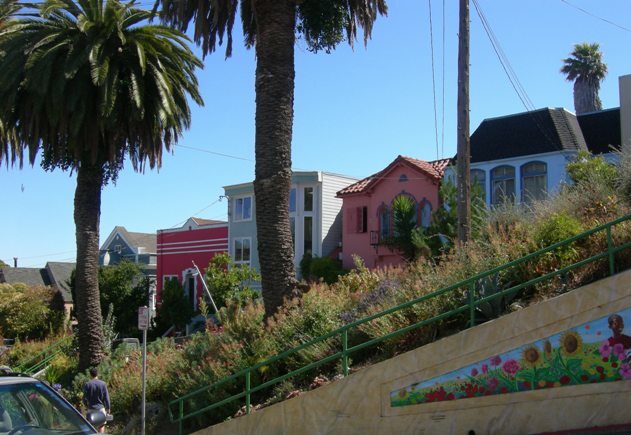 The Canary Island Palms in the center of Dolores, about 175 of them, are landmark trees. Among them are four small endangered Guadalupe palm trees. Then we saw an ancient Brazilian Pepper Tree, growing on a traffic island. It had also lost branches after storms. The tour ended at Quesada and 3rd street in Bayview Hunter’s Point, where the community saved a line of 13 Canary Island Palms in the median, planted around 1932. The city apparently wanted to fell them in the 1970s, because they needed too much maintenance. 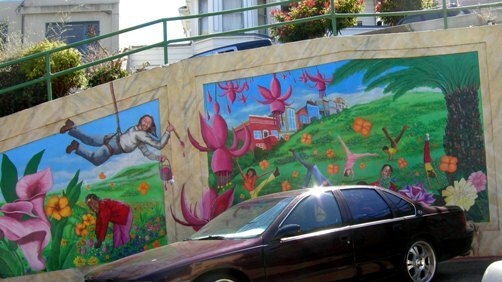 A few years later, neighbors started Quesada Gardens along the length of the median, and then added a mural at a cul-de-sac at the street’s end. It was really inspiring, especially since one of the leaders explained that the median had been a trash dump before, and the cul-de-sac a place where people stripped down stolen cars. Overhead, squawking parrots flew in to feast on the palm fruit. It was sunny and pretty, and despite being in problem neighborhood, quite a few people on the tour thought they’d like to live there. Mei Ling Hui, the cheery Urban Forests Coordinator who led the tour, remarked that most San Fran street trees were not native, and were similar species to street trees in Melbourne, Australia. She commented that eucalyptus were planted (1) because people liked eucalyptus and palm trees back then, and (2) developers planted them to drain marshes and furnish lumber for building, but it turned out eucalyptus makes crappy timber. She specifically mentioned Sutro Forest. We pointed out that Sutro is on record as saying they were for the enjoyment of people who walked among them; it was only after his death that his heirs tried to start a lumber operation. She kindly made the correction. She said non-native trees were planted because they did really well as street trees, and provided the benefits of urban forest trees, unlike trees from nearer here that required much more care and herbicides. Two authorities in the city plant trees: the Department of Public Works, and the non-profit Friends of the Urban Forest. On the tour, I saw a lot of newly planted trees. Most were doing well, though a few were leaning over despite the cage of wooden posts intended to hold them upright. It was encouraging. Total trees visited: 6 eucalyptus; many Canary Island Palms; 4 Guadalupe palms; a fig and a pepper tree. I’d expected to learn more about trees; instead I learned about local history, community gardens, and the Landmark tree program. The Landmarking process is lengthy, and complicated, with an uncertain payoff. The result is that many truly spectacular trees are not landmarked. Some trees are landmarked because of a historical connection rather than because the tree itself is extraordinary. Some of the Presidio eucs are larger and more impressive than the ones we saw. Many of the Sutro Forest eucs are taller. I’ve seen some glorious araucarias in the western part of the city. Even the city’s Christmas tree (in front of McLaren Lodge) isn’t landmarked because Rec&Park doesn’t want to. Thirteen Canary Island Date Palms (Phoenix canariensis) located throughout the Quesada Street median West of Third St. to the dead end. 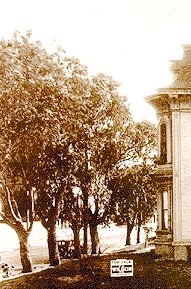 The grove of Guadalupe Palm (Brahea edulis) in the Dolores St. median, across from 1608-1650 Dolores Street. California Buckeye tree (Aesculus Californica) located behind 757 Pennsylvania Street. But I didn’t get to see the city’s most spectacular trees. I might start blogging about those. There are certainly some really wonderful trees in San Francisco. I’ll be looking out for them. The only problem is how to photograph really huge trees. Meanwhile, ‘BurritoJustice’ carried a great tree post on their blog. With photographs. ← Lost dog in Contra Costa: FOUND! Great report. It will be worth re-reading for the history you have provided on the Landmark tree program. What defines a spectacular tree? I have favorite trees that I like to look at when I walk in certain areas but not sure they qualify as spectacular.